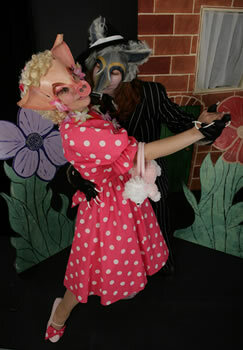 Info on the shows we have currently touring for theatres, schools and art centres. 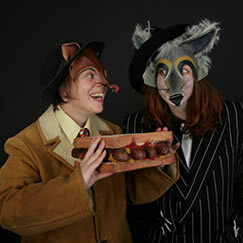 "A children's show with plenty of bite"
AUDIENCE: The show offers much huffing & puffing and is suitable for children aged 4 - 11, their families or anyone who simply enjoys a good yarn ! LENGTH: The show lasts approx. 80 minutes (we can incorporate an interval if required). TECHNICAL REQUIREMENTS: We tour with our own technician who runs the show, but will require the assistance of an in-house technician. Lighting can be flexible and adapted to what is available. Get-in time: 2 hours; Get-out time: 1 hour. WORKSHOPS : In addition to the show, we are able to offer children's workshops within the theatre venue or as local school placements. This provides an opportunity to explore moments of the show and ultimately take part in the performance. ABOUT: Written by Mark Scott-Ison, and inspired by the classic children's stories The Three Little Pigs and Little Red Riding Hood, it is a lively interpretation of some familiar characters. The show takes a humorous new look at the Big Bad Wolf and finds the villainous rogue in a witness box at a court room, where he defends himself and his dastardly deeds by telling us his side of the story. 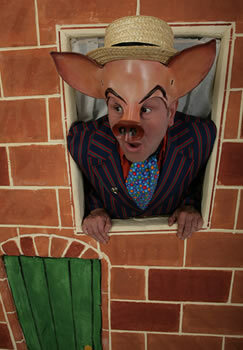 The show is packed full of colourful characters that children love, such as former 'Pig Idol' superstar Patsy Pig and a certain feisty little lady in a red hoody (trained in three different types of martial arts!). FEATURES : Featuring an original soundtrack of catchy songs, by Bronwyn Harrison, the show is a feast of fun, laughter and suspense with plenty of audience participation.